← NACCHO Alcohol News : Government needs to listen to Aboriginal Health org evidence on what works to reduce alcoholism. “High blood pressure is a silent killer because there are no obvious signs or symptoms, the only way to know is to ask your GP for regular check-ups. “High blood pressure is an important risk factor for stroke, heart disease, and other cardiovascular diseases. According to World Health Organization guidelines, a person is defined as having high blood pressure if their systolic or diastolic blood pressure is equal to or greater than 140/90 mmHg. 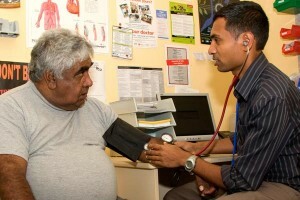 In 2012–13, one in five (20%) Aboriginal and Torres Strait islander people aged 18 years and over had measured high blood pressure. Overall, Aboriginal and Torres Strait Islander men were significantly more likely than women to have recorded a high blood pressure reading (22% compared with 18%). Measured high blood pressure was significantly different for men and women in the 25–34 year age group (17% compared with 10%). The proportion of Aboriginal and Torres Strait Islander adults with measured high blood pressure increased with age, ranging from 6% of 18–24 year olds to 37% of people aged 55 years and over. New Hypertension Guidelines released by the National Heart Foundation today will provide healthcare professionals with the latest evidence when dealing with patients who have blood pressure. This latest guideline includes both a primary and secondary prevention focus on the contemporary management of hypertension in the context of an aging population with increasing complexities. Heart Foundation Chief Medical Advisor Prof Garry Jennings said the Guideline differs from some other guidelines due to recent evidence outside the patient groups covered by the management of absolute cardiovascular risk (NVDPA, 2012) as well as information arising from new trials addressing blood pressure as a single risk factor in people with moderate or high risk measured using a variety of methods. “This Guideline offers advice on new areas including out-of-clinic blood pressure measurement using ambulatory or home procedures, white-coat hypertension and blood pressure variability,” Prof Jennings said. “A key difference is the new evidence for a target blood pressure of <120mmHg in some patient groups. The new Guideline complements the current Absolute Risk Guidelines, addressing additional age groups, important comorbidities or target organ damage in hypertension that are known to increase risk. “In these guidelines it has been necessary to make recommendations based on a lot of recent evidence on management of hypertension,” Prof Jennings said. “There is no one size fits all approach when managing hypertension but these guidelines will help clinicians address some of the variables each individual patient provides. “We know that GPs want as much certainty as possible to help personalise their approach to treating patients with hypertension. The National Blood Pressure and Vascular Disease Advisory Committee, an expert committee of the National Heart Foundation, developed the new guideline. Prof Jennings said committee members were selected based on their recognised expertise and included representatives from Royal Australian College of General Practitioners, National Stroke Foundation, Kidney Health Australia, Hypertension Nurses Australia, National Prescribing Service Medicinewise and the High Blood Pressure Research Council of Australia. The RACGP has recommended the Guideline for approval as an Accepted Clinical Resource. Prof Jennings said all Australians aged 18 years and over should have their blood pressure measured by a health professional at least every two years. More than one in 10 Australians aged 30-65 (12%) have NOT had a blood pressure check in the last two years. Heart Foundation estimates that more than 900,000 Australians aged 30-65 have high blood pressure or high cholesterol but don’t know it. Medical professionals must also take responsibility for their actions. For 6 years a family member was concerned about their high blood pressure and the medication not reducing it to a healthy level. Repeated requests were ignored by a number of doctors. Perhaps because they presented as a youngish non-smoker, fit and hard-working, healthy weight range patient it was easier to ignore. Or, maybe it was some other reason, but with a diastolic continually above 100, and with patient concern, surely action should have been taken earlier. Finally, a doctor acted and with appropriate medication, blood pressure is within normal range. Doctors must also accept responsibility for their actions, or lack of actions.